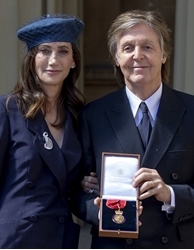 Good Day Sunshine: Paul McCartney award at Buckingham Palace . Beatles Radio: The Beatles, Solos, Covers, Birthdays, News The Fab 4 and More! Paul McCartney paid tribute to his parents after a ceremony making him a Companion of Honor at Buckingham Palace. The 75-year-old songwriter, bass player and singer received a knighthood 21 years ago.Ringo Starr, the Beatles’ drummer, was made a knight earlier this year. The other two Beatles, John Lennon and George Harrison, have both died. The Liverpool band shot to worldwide fame in the early 1960s.